A distinctive feature of The Mount, Mill Hill International is its mission to help the international pupil integrate into the whole school community. This is achieved through a dedicated team of staff helping each pupil to discover the opportunities on offer at Mill Hill School that might suit their interests and personalities. 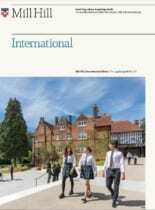 From the first day the international pupil arrives in the School, they are introduced to the Mill Hill School community and a programme of participation in activities, whether academic, co-curricular or social is established for every pupil.